The gears in my acrylic extruder were skipping where there was a moderate amount of resistance given by the drive shaft. Also, because of the distance between the two gears being too big, there was a considerable backlash/play. 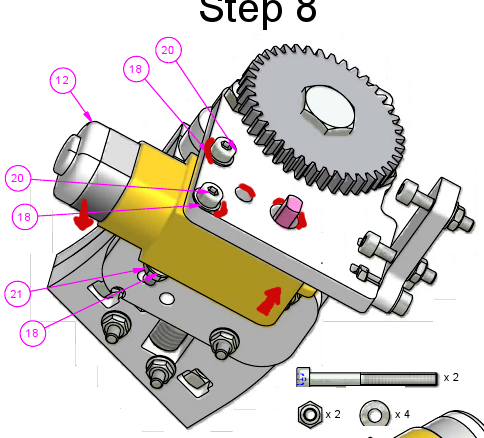 Since the encoder is on a different gear than the target drive shaft, this would waste a lot of the accuracy gained by the encoder. 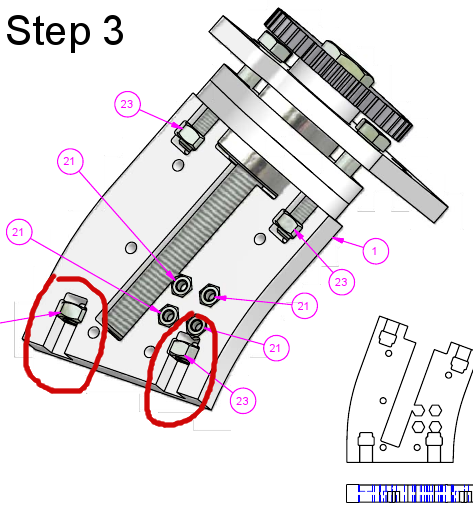 I used a drill to enlarge the holes in the direction where it is red in the following drawing. The motor could then be fixed, turned a little counter-clockwise. The gears are now closer to eachother. 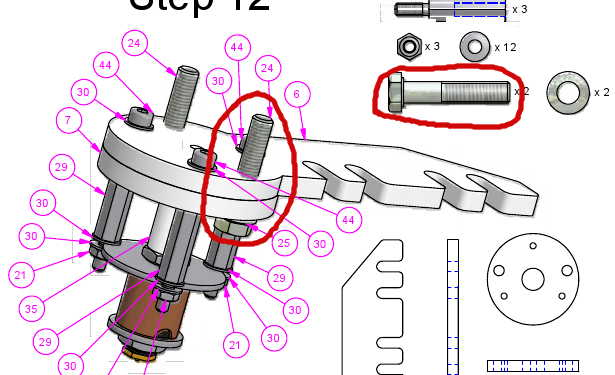 Also, it was really hard to remove the drive shaft holder from the part below it, because the big(gest) washer from the heater barrel was in the way of the M5 hex headed bolts (their positions encircled in red). If you place these bolts the other way around (in the top and main plate) you do not have this problem. Also, this prevents you from breaking the top plate or main plate by screwing the bolt too far up the caged nut. It will break open the cage and will need superglue. The hex headed bolts are actually a bit too long. An extra washer would solve this, but my solution of using the bolts in the other direction (head between top and main plate), this is solved as well, giving the extra benefit that the heater section and the top section can be separated more easily.